In this guide, we describe how to integrate Clause with the Kaleido platform so that you can store key contract events on your consortia’s tamper-proof blockchain so that they are securely distributed to all your members. Kaleido is a Blockchain Software-as-a-Service platform that lets you quickly provision and manage an Ethereum network. If you've already provisioned a network on Kaleido, skip to step 2. Visit the Kaleido Dashboard to create an account and then follow the user interface instructions to build your consortium and provision nodes. Step-by-step instructions are also provided in the Create your network section of the Kaleido docs. Go to https://kaleido-io.github.io/kaleido-samples-gallery/ and set up the Kaleido connection information. The Node RPC Endpoint can be found in the Node details page. Once you've saved your connection information in the Kaleido Samples Gallery, click Audit Log in the header, to deploy the Audit Log smart contract to your network. 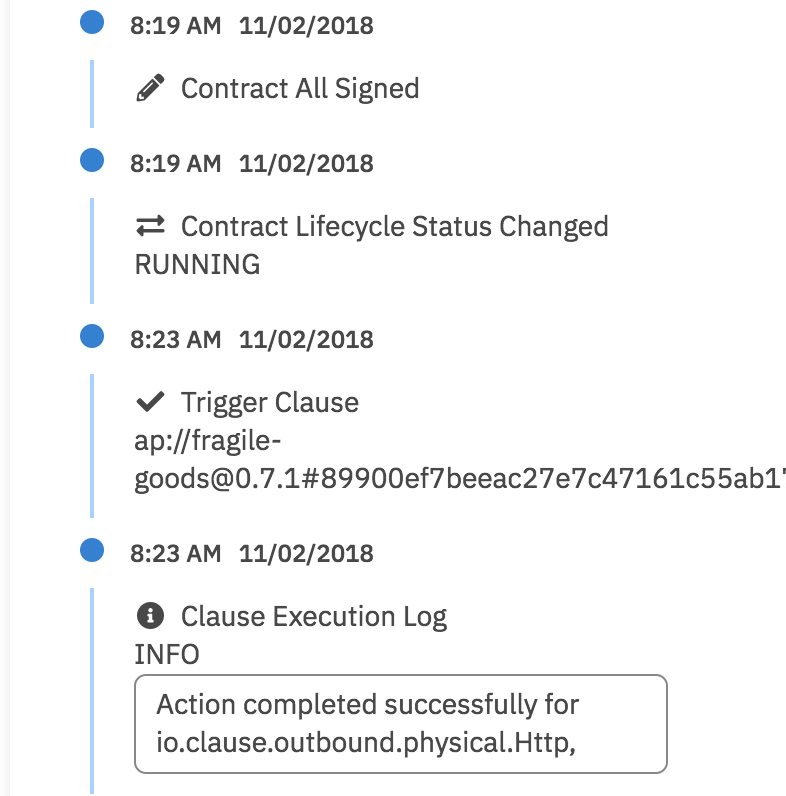 Configure your Smart Clause's Action to use a Custom Action. 1. 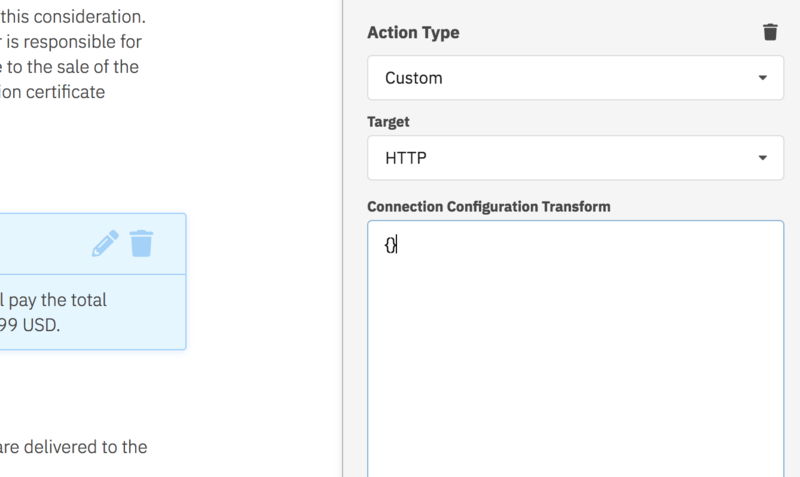 Select HTTP as the target for your custom action. Where the following values are replaced with values from Kaleido. Further details are available from the Kaleido Connect page, available at the bottom of the Node details page in Kaleido. KALEIDO_CONNECT_WEBHOOK_URL - For example, https://xxxxxxxxxx-xxxxxxxxxx-connect.us-east-2.kaleido.io . This is available from the node details page in the Kaleido console. KALEIDO_CREDENTIALS_BASE64 - A base64 encoding of your username and password. Available when you create App Credentials in Kaleido. Hint: Follow this guide to safely create a base64 encoding of your username and password. Use the format, user:password as the input. Also, note that payload sent to Kaleido under params should match a field from your Smart Clause's response. In this sample, we use response.description that is provided by all Payment Obligations. Remember that Clause Actions are only processed when your contract is running. Contracts are running once all signatures have been received. Then finally, switch to the Kaleido Audit Log UI to view the obligation record on the Ethereum blockchain.